As our recent research has shown, the oldest adults in the U.S. (age 65+) are among the least likely to have high-speed access. (Just 31% have broadband at home). They are also the least likely to see the lack of having broadband as a disadvantage. However, even though older adults may be among the most resistant to broadband, there is evidence that once these users get a taste of high-speed access, they often come to rely on the internet as an everyday utility in their lives. While the rates of broadband adoption among the oldest users are low, the frequency of use among those who do have high-speed access is relatively close to the usage levels of younger users. Looking at adults ages 65 and older who have high-speed internet connections at home, 72% say they use the internet on a typical day. That compares with 77% of broadband users ages 50-64, 84% of those ages 30-49 and 86% of those ages 18-29. 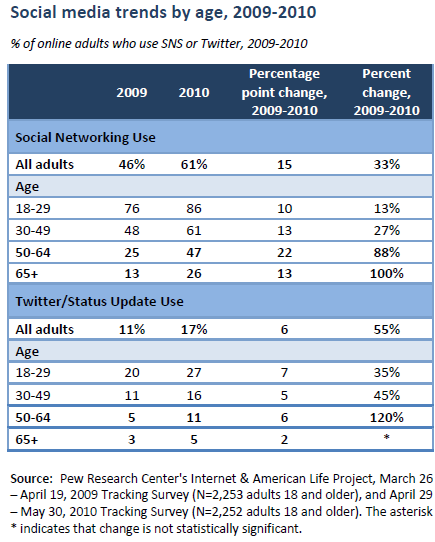 So why might social media be increasingly attractive to older adults? First, our research shows that social networking users are much more likely to reconnect with people from their past, and these renewed connections can provide a powerful support network when people near retirement or embark on a new career. In our September 2009 survey, about half of all social networking users ages 50 and older said they had been contacted by someone from their past who found them online. Overall, 64% of social networking users have searched for information about someone from their past, compared with 30% of non-users. Second, older adults are more likely to be living with a chronic disease , and those living with these diseases are more likely to reach out for support online. There are two activities which stand out among people living with chronic disease: blogging and participating in online health discussions. When other demographic factors are held constant, having a chronic disease significantly increases an internet user’s likelihood to say they work on a blog or contribute to an online discussion, a listserv, or other forum that helps people with personal issues or health problems. And finally, social media bridges generational gaps. While the results can sometimes be messy, these social spaces pool together users from very different parts of people’s lives and provide the opportunity to share skills across generational divides. There are few other spaces—online or offline—where tweens, teens, sandwich generation members, grandparents, friends and neighbors regularly intersect and communicate across the same network. Photos, videos and updates shared on a daily basis can provide a valuable connection to faraway family and friends who are tied together in a variety of ways. The children and grandchildren of older adults are documenting many aspects of their lives through social media, and these are also becoming popular spaces for professional networking, continuing education, and political participation. Various organizations that work with older adults—such as AARP, Older Adults Technology Services (OATS) and Project GOAL—have been actively promoting social media resources that are relevant to mature users. In March, the FCC’s National Broadband Plan specifically requested additional funding from Congress to invest in digital literacy training programs for older Americans. One idea proposed under the plan was to support a “National Digital Literacy Corps” that trains volunteers to teach digital skills to those who are least connected in their communities—including pairing tech-savvy digital natives with seniors. With 86% of internet users ages 18-29 using social networking sites and 60% doing so on a typical day, it is not hard to imagine that some of these young mentors would be eager to share their skills in profile management with older users.